Edness Kimball Wilkins State Park is a peaceful and quiet day-use only park on the shore of the North Platte River, east of Casper. This is a natural wildlife habitat, shaded with large old cottonwoods beside an excellent fishing, rafting and canoeing river. The park features picnic tables, fire grills, playgrounds, group shelters and a boat launch ramp for canoes and rafts only. There is also a universally accessible fishing pier jutting into the river. 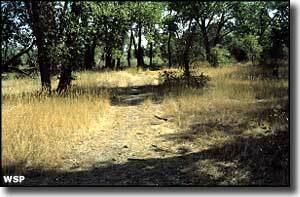 There are 2.8 miles of accessible hard-surfaced paths winding in and out among the cottonwoods and through the riparian areas next to the river. The park even offers a small swimming area for those who are so inclined. Bird watchers love this park, too, with more than 40 species of the avian persuasion hanging out here for the summer. 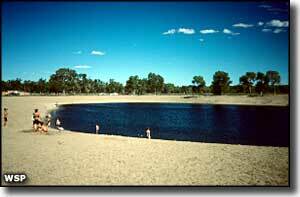 The Edness K. Wilkins State Park can be reached via the I-25 to exit 182 and then follow US 20-26. Photos courtesy of Wyoming State Parks.